PUR Gum does not contain aspartame! 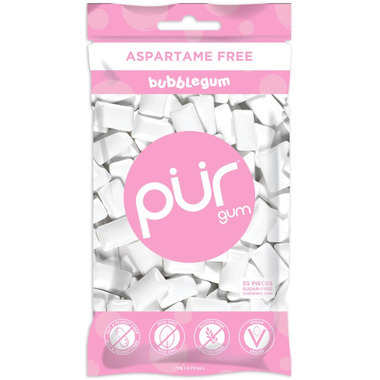 PUR Gum is the better-for-you, aspartame-free gum, made with Xylitol. PUR is gluten-free, nut-free, soy-free, vegan, diabetes-friendly with a very low-glycemic index. My kids love this gum and the fact that itâ€™s aspartame free makes it even better! Love what the gum does not contain, but it looses flavour so quickly! A great aspartame free choice, and it tastes good as well. It's always my go-to choice! Great gum! Fun flavours! Aspartame free, which is great, first ingredient is xylitol. ! I love that they come in a large, resealable bag (55 pieces). Packaging is super cute. I really like this product for the taste and the benefits of xylitol. I never grew out of liking bubble gum and the idea of one that is good for me was too much to pass up. I would say I was a little disappointed in the flavour initially. I thought it had more of a fruity taste than the traditional bubble gum flavour I was used to. However, I've become accustomed to it and now enjoy it very much! It tastes ok, my little one loves it. I like the ingredients and feel better about giving this to her as opposed to other types of gum. I find the taste doesn't last long, but I really only buy it for the kids. My kids love this flavor and I love the fact that it's free of aspartame! This gum is great. Also check out some other health benefits from xylitol. My go-to gum. Tastes great and contains no sugar. Don't chew too many in a day though as it may cause stomach upset! Great taste, flavour lasts a long time. My son loves it. We picked it up because xylitol is supposed to be good for oral health. My kids' favourite flavour. I put a piece in their lunch boxes if they have crackers for lunch or a cookie snack. They chew it afterwards to help clean their teeth. I can't have artificial sweetner, nor can I have mint. These are perfect! The bubblegum flavor is hard to come by in stores (can only find the minty ones) but Well.ca offering this flavor in the larger size is perfect! long tasting. soft texture. Loving it! This gum is so good, my daughter took it to school and shared it with her friends! It really does taste like bubblegum. It is the best flavour! I also appreciate the fact that it is reasonably priced. My son is allergic to artificial sweeteners, but xylitol is okay for him. Pur is a very good gum and he loves the new bubble gum flavour. The bags are a good deal too or the packs. This is my most favourite gum. I love that they are more natural than most. I love the taste, it's not strong or weak, just perfect. The best bubble gum ive ever tasted. So happy they have bags of these, amazing!! The best aspartame free gum!. It holds its flavour and is well worth the price. Great selection to choose from. The bubblegum flavour really tastes like bubblegum. I've tried so many aspartame free gum products. This is by far the best. It does not turn into a leather like consistency. I've been buying it for a few years. Love the taste of this product! I can't believe it tastes so good without sugar! I like it! Almost a slight lemon undertone? Healthier with no aspartame. Flavour doesn't last super long.